This month's topic from the Sprue Cutters Union is, "What subject relaxes you the most?" Funny you should ask. After a few hours in the workshop I often find myself grumbling that I need to find a relaxing hobby. While I say that in jest, it does have an element of truth to it. Our hobby, this supposedly relaxing hobby, is full of small, stressful moments where one task, one part, one brushstroke can be the difference between success or disaster. It's that moment when you remove the masking from your canopy hoping the paint didn't seep beneath it. That moment you attach that length of link-by-link track to your tank and hope that it fits perfectly as it did yesterday. That moment when you carefully attach a the railing to a 1/700 scale destroyer and hope you don't get super glue everywhere. I'd bet that each of us experiences a heart rate that rivals that of any marathon runner as he approaches the finish line. Well, almost. I gotta be honest with you and my fellow Union members. 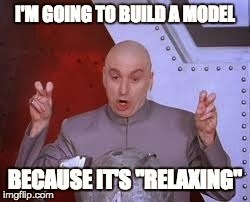 I can't think of a single model that offers me a truly "stress-free" experience. Every one of them comes with its share of challenges and stress. That said, I generally enjoy 95 percent of the modeling, painting, and weathering process; the remaining 5 percent I struggle to overcome and master, even after 30 years in the hobby and dozens of builds under my belt. I'm not there yet, though I hope to be some day. In the meantime, when I want to enjoy something that's truly stress-free, I cook up a pot of risotto. I've mastered that and enjoy preparing it for friends. Maybe I should take some to the Nats in July for my readers! 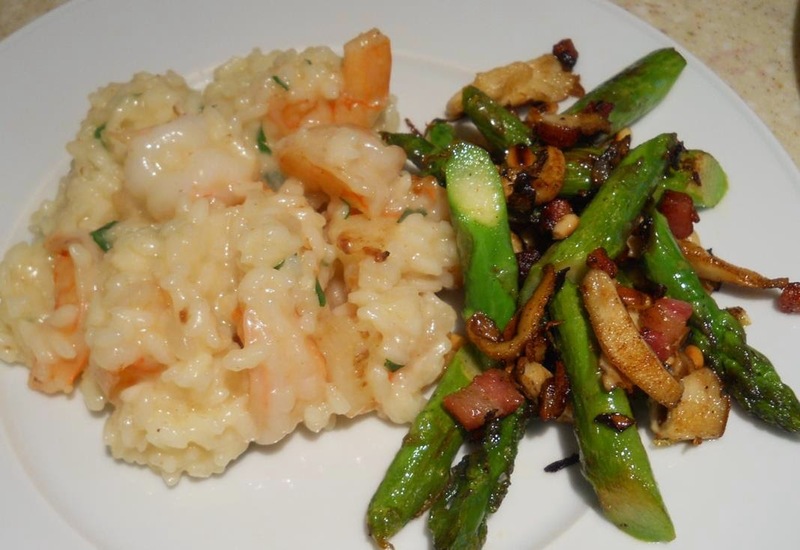 1:1 scale risotto and shrimp; asparagus with pancetta and mushrooms. Catch up with other members' responses to this month's topic here. Very good....i have to agree there are those moments when i am placing a decal that cost more than the kit i'm working on, plenty of high blood pressure and as my wife says lots of hard breathing as i do things i am focused on. So true it is the small bits that can be the hero to zero bits for a build....but if it was easy everyone would do it. Indeed. I reckon that once I left the stage of slapping the kit together straight from the box and applying the decals to the unpainted model, I also left the realm of any feeling that this was "relaxing". With ever increasing desire (and not some little feeling that it "should" be done) for additional detailing, correction, modification, and scratchbuilding the non-relaxing aspects also increased. I still derived pleasure from it all, but it was never relaxing. Relaxing was lying down in a comfy place.